BlytheLife.com » A name, a name, my kingdom for a name. This is my birthday doll! She is a Hi-Ho Marine Blythe, RBL+ mold. I will be deboxing her on my actual birthday and I’d like for her to have some kind of name when the time comes. Here she is! My other dolls have the following names, for those who are curious and want to give suggestions for this new lovely sunshiney-yellow doll: Sophie, Belarus, Tertiary Jane, Bennett, Eden Mouse, Kindred, Emmalynn, Moxie, Molybdenum (Mollie), Primrose, Lillian (Lily) Rose, Halo, Cedar, and Kitty Brighton. 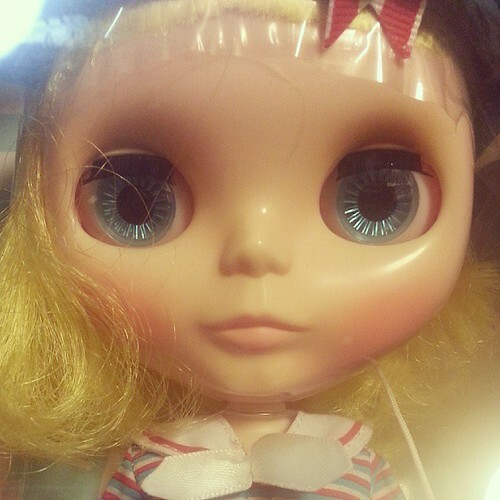 QOTW: What influences doll naming? Isadora, for some reason that was the first name to pop into my head. It means “Gift of Isis”. Who am I to suggest though, I named my last doll Claudia. how about Rhonda? 😉 lol! I have a birthday doll wrapped up waiting for me another week and a half too… I have been thinking on names for a month or so and I have no idea lol Hopefully a name will stick when I un box her. Happy Birthday… I hope you find a good name!